This evocative phrase was created by the eighteenth century English composer Benjamin Cooke, who was organist at Westminster Abbey and master of the Abbey’s choristers for over thirty years. He was also organist at St. Martin-in-the-Fields so he must have had a busy life, but he wrote little religious music and instead devoted himself to light songs. One of these is Albion, thy sea-encircled isle. 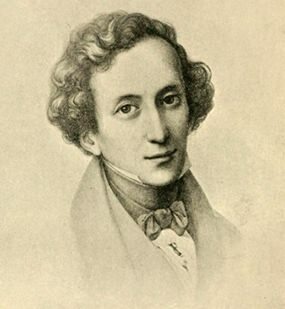 Mendelssohn at 26 (Pencil Drawing by Mücke). Great Britain is known more poetically as the British Isles. This is hardly surprising because it has about 6,289 islands. Not all that long ago, I used to live on one of the smaller ones. Perhaps this geographical curiosity was why the BBC radio programme Desert Island Discs became so popular. It’s been broadcast weekly since 1942 and the signature tune is a piece called By the Sleepy Lagoon, by Eric Coates. Seagull cries were dubbed over the music to add a dash of local colour but it was eventually realised that seagulls live in the northern hemisphere and would be about as likely on a desert island as a penguin. The sound effect was dutifully changed to the squawking of tropical birds but this proved unpopular and the seagulls were reinstated, no doubt to their immense satisfaction. Britain has long been celebrated in music by composers like Purcell, Britten, Vaughan Williams, Bax, Elgar and Butterworth. But these of course are British composers, so it’s hardly surprising. However, at the age of twenty, the German composer Mendelssohn visited Britain. It had a lasting impression on him. This concert overture is also known as Fingal’s Cave, named after a natural feature of the Scottish island of Staffa, one of the smallest islands of the Southern Hebrides. Even in the nineteenth century, the cave was a tourist attraction because of its spectacular size and appearance. The eerie sounds produced by the echoes of waves gave it the atmosphere of a Neolithic cathedral. Its Gaelic name means “the melodious cave”. Jules Verne came to see it and so did William Wordsworth, John Keats, Alfred Lord Tennyson and J. M. Turner, who painted it in 1832. Even Queen Victoria made the trip. One is tempted to ask, who was Fingal? He was possibly (or possibly wasn’t) a mythical hunter-warrior of Irish mythology who might (or might not) have lived in the third century. Whoever he was, the cave would have certainly been on Mendelssohn’s itinerary when, in the summer of 1829 he set out on a walking tour of Scotland with his friend Karl Klingemann. After visiting the Hebrides, Mendelssohn sketched the opening theme of the overture which came to him while watching the waves. It was originally called Overture for a Lonely Isle, which seems to me rather more evocative than its eventual title. Nearly six hundred miles to the south are the Channel Islands, which although part of Britain are closer to France. In 1904, the composer Debussy spent some time on the island of Jersey where he completed a piano piece he’d already started. It was called L’isle joyeuse – The Happy Isle. This remarkable piece was originally inspired by a painting by Jean-Antoine Watteau in which a merry group of people appear to be departing for the mythical island of Cythera in the Mediterranean, birthplace of Venus, the Goddess of Love. Debussy uses the English spelling of “Isle” in the title rather than the French, almost certainly alluding to Jersey where he escaped for a romantic holiday with Emma Bardac, who eventually became his second wife. It would seem that both islands – the mythical one and the real one – influenced Debussy’s piece. It’s full of lightness and grace, words that could equally apply to Watteau’s painting. The Catalan pianist Ricardo Viñes, who gave the first performance, said that it reminded him of Turner’s paintings. Strangely enough, Debussy was fascinated by the paintings of J. M. Turner and he’d studied them on his first visit to London in 1902. Many of the features of Debussy’s mature musical style are there, but Debussy himself admitted that the piece “is difficult to play”. Difficult indeed, because it’s a challenge just to play the notes in the right order at the right speed, let alone make musical sense of them. Canadian Marc-Andre Hamelin provides a dazzling performance, and this superb CBC video captures the excitement and magic.